Audience evolution happens when the people you serve shifts over time. When this happens, it’s more important than ever to create clear messaging. Has your audience changed since you started your business? If you’ve gotten more specific on who your target audience is, shifted who you serve, or moved beyond your original clients, this episode is for you. It’s not unusual for your audience to evolve over time, especially if you run a personal brand or started your business without a clear idea of who you serve. 00:00 – 4:47: Welcome and Introduction! 11:27 – 16:50: How do you know when you are at the center of the “bullseye”? When you first started your business you may not have had a clear idea of who you were serving. Maybe you were trying to reach “everyone”, and as a result you didn’t really speak to anyone. Now that you’ve been around the block a bit, you know that honing in on a more narrow audience will only help your business. 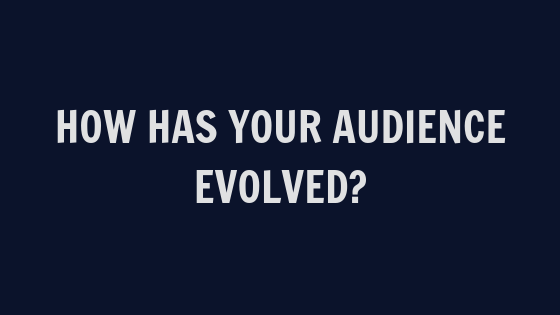 This audience evolution reflects everything you’ve learned as an entrepreneur. You’ve probably served some clients who weren’t a great fit, which has allowed you to know who to say no to. You’ve probably also found some dream clients who you want to clone. You now know that trying to please everyone who crosses your feed only dilutes your message and underserves the people you most love to serve (and who most need you). Here’s what you need to remember: Your message isn’t meant for everyone and that’s okay. It’s not your responsibility to accommodate everyone. That said, there’s no need to overly narrow your audience. This is where the difference between an Ideal Client Avatar and a Target Audience comes in. Think of your audience like a dartboard. At the center of the board is the Ideal Client Avatar. Moving out from the center are members of your Target Audience. People who are close to your ICA, but not a perfect match. Obviously, if you’re playing darts, you want to hit the bullseye. It gets you the most points and a sure victory. But it would be ridiculous to expect someone to hit the center of the board every single time. Hitting anywhere else on the board still gets you points — and often can also lead to a win. What you don’t want to do is throw the dart so far off that it hits the wall next to the board. You don’t get any points for that (just frustration and a paint job). If your audience has evolved and you’ve gotten more clear on your dartboard, be clear with your audience. Your target audience doesn’t have to be a secret. When you pull back the curtain and show your audience the shifts you’re undergoing, you make it easy for them to identify whether they’re on the board or not. The more you share, the easier it is to hit your bullseye clients to step forward. Your message is what allows you to connect with your audience. Once you’re crystal clear on your dartboard, it’s time to evolve your message to connect with your people and invite them to work with you. This goes deeper than simply saying, “I work with single moms who are between the ages of 30 and 45 and want to lose weight” or “We work with personal brands and service-based businesses who need a clear, compelling message” (that’s us). It’s the sort of thing that shows up in every piece of content you produce. As you draw in more of your target audience, it’s important to build relationships with them. Only through these relationships can you grow. And yes you can do this through a “passive” business model, too. You don’t need to sit down and have coffee with every person on your list to understand whether they’re in a relationship with you. Look at the data. Are they engaging with your content? Which content? What does that tell you about them? When you connect with the right people you are able to constantly hone, evaluate, and refine your business. 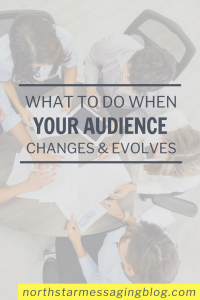 This allows you to manage your audience evolution in a way that isn’t confusing to the people you serve and allows you to feel good about the work you do. The Evolved Entrepreneur Challenge runs LIVE periodically, but even if it’s not a live session you can access the materials and work at your own pace. During the challenge, you’ll celebrate where you are, audit your content, and update your message for where you are right now.